Biodiversity also is affected by pollution of land, water, or air. 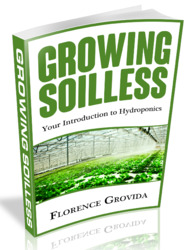 Soil that is contaminated with oil, chemicals, or other pollutants can harm plants or limit plant growth. Because plants provide valuable habitat for many species, any reduction in plant growth can limit biodiversity. Water Pollution Waterdwelling organisms are easily harmed by pesticides, chemicals, oil, and other pollutants that contaminate the water. Water pollutants often come from factories, ships, or runoff from roads, lawns, and farms. Waterways also can be polluted when people dispose of wastes improperly. For example, excess water from streets and roads runs into storm drains during rainstorms. This water usually flows untreated into nearby waterways. Storm drains should never be used to dispose of used motor oil, paints, solvents, or other liquid wastes. These pollutants can kill aquatic plants, fish, frogs, insects, and the organisms they depend on for food. Air Pollution A form of water pollution known as acid rain is caused by air pollution. Acid rain forms when sulfur dioxide and nitrogen oxide released by industries and automobiles combine with water vapor in the air. As Figure 12 shows, acid rain can have serious effects on trees. It washes calcium and other nutrients from the soil, making the soil less fertile. One tree species that is particularly vulnerable to acid rain is the sugar maple. Many sugar maple trees in New England and New York have suffered major damage from acid rain. Acid rain also harms fish and other organisms that live in lakes and streams. Some lakes in Canada have become so acidic that they have lost almost all of their fish species. In the United States, 14 eastern states have acid rain levels high enough to harm aquatic life. Air pollution from factories, power plants, and automobiles can harm sensitive tissues of many organisms. For example, air pollution can damage the leaves or needles of some trees. This can weaken them and make these trees less able to survive diseases, attacks by insects and other pests, or environmental stresses such as drought or flooding. 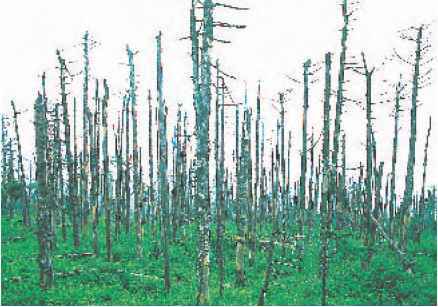 Figure 12 Acid rain can damage the leaves and other tissues of trees. Explain how this damage can affect other organisms. 1. Soak 50 mustard seeds in water and another 50 mustard seeds in vinegar (an acid) for 24 hours. 2. Wrap each group of seeds in a moist paper towel. 3. Put them into separate, self-sealing plastic bags. Seal and label each bag. 4. After 3 days, open each bag, examine the seeds, and record the number that show evidence of growth. 1. Describe the effect of an acid on mustard seed growth. 2. 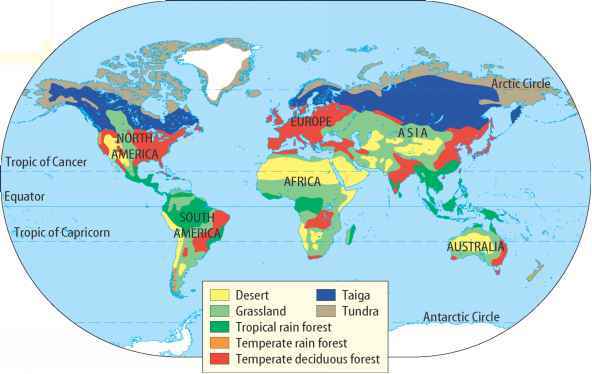 Explain how acid rain could affect plant biodiversity.